Yesterday I on a bus ride from São Paulo I had the opportunity to see some of the developments tools available on OSX. 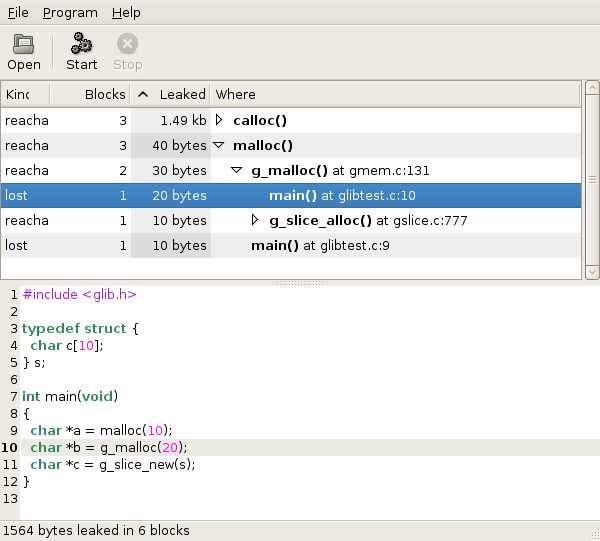 Shark and mallocdebug are quite interesting, bling-bling for the developer masses. When I woke up this morning I realized that it shouldn’t be too difficult to do something similar on top of valgrind. It’s quite useful already, it groups all the leaks by the topmost function which is a bit easier to follow than the output valgrind usually gives us. You can find a tarball here if you want to play around with it. This entry was posted in Blogroll, General, GNOME, PyGTK, Python. Bookmark the permalink. Wow ! Can you integrate this in Anjuta ? Could you set up a public repository with the DSCM of your choice? I’m very interested in using something similar for doing reports when running unittests with Check and maybe I will look into stealing some of your code. It’s another Valgrind front-end for gnome. Thanks for starting that one, it looks good. bersace: I don’t really use Anjuta, but feel free to integrate it yourself, it shouldn’t be that difficult, just run andvare -s program args. Emanuele: I uploaded a bzr repo to launchpad and updated the blog entry to tell where you can find it. Stéphane: Alleyoop is written in C, I wouldn’t dream of writing a program in C.